The name “phosphorus” is derived from Greek, meaning “light-bearing”. · The name “phosphorus” is derived from Greek, meaning “light-bearing”. · odour. On exposure to air, it oxidises into whitish fumes of phosphorus pentoxide. Hence, it is generally stored under water. Yellow phosphorus is highly combustible and ignites into flame at 340C. It is luminescent and glows in the dark (phosphorescence). · substance. It is insoluble and relatively harmless, since it is not absorbed from the GI tract. · “Black phosphorus” is the inert, nontoxic allotropic form of elemental phosphorus. · Derivatives and related compounds of phosphorus include phosphoric acid, phosphine, aluminium phosphide and zinc phosphide. 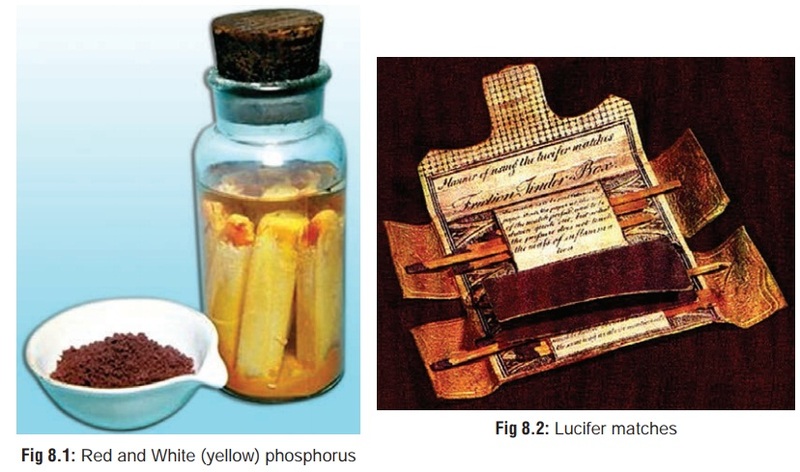 · Matches: Yellow phosphorus was extensively used in themanufacture of friction matches during the 19th century. However, because of its propensity to produce chronic poisoning in workers of the match industry, most countries agreed at an international convention in Berne, Switzerland in 1906 to prohibit the manufacture and import of yellow phosphorus for the making of matches. Hence, these so-called “lucifer matches” gradually (and fortunately) faded out (Fig 8.2). Today’s “safety match” contains only potassium chlorate and antimony sulfide (Fig 8.3). It has to be struck against a prepared surface to ignite it, which is provided by the sides of the match box being coated with powdered glass and red phosphorus. · Fireworks: Although the use of yellow phosphorus infireworks is prohibited in Western countries, it is still an important ingredient in several types of fireworks manu-factured in India. · Military uses: Yellow phosphorus is an ingredient of tracerbullets, incendiary bombs, smoke screens, and air-sea rescue flares. · Insecticide and rodenticide: There are several pastes andpowders available in India which contain phosphorus (or zinc phosphide) used for killing cockroaches and rats. Such pastes are usually mixed with molasses or butter and spread on bread as bait. Obviously, unintentional ingestion by chil-dren is quite possible leading to serious poisoning. About 60 mg (roughly 1 mg/kg body weight). · Yellow phosphorus, a protoplasmic poison is a potent hepatotoxin (Table 8.1). · In large doses, it can cause shock and cardiovascular collapse since it is also toxic to the heart. · Locally, it produces severe irritation of skin and mucosa. · Rate of absorption is greatly enhanced if phosphorus is administered in an oily vehicle. This results from ingestion of a massive dose, i.e. more than 1 to 2 grams. The dominant clinical picture is one of peripheral vascular collapse. Death usually occurs in 12 to 24 hours, and signs of hepatic or renal damage are not seen. Today, most cases of phosphorus poisoning fall in this category. The clinical manifestations characteristically occur in three stages. · Local effects include severe burning pain, vomiting, diarrhoea, and abdominal pain. · Breath smells of garlic. · Vomitus and stools may be luminous in the dark. There may be haematemesis. Faint fumes may emanate from the stools (Smoky stool syndrome). · This is an essentially symptom-free (treacherous) period, and the patient may feel well enough to be discharged from the hospital. · This is due to the systemic effects of phosphorus after it has been absorbed. · There is a return of the digestive symptoms with increased severity. · In addition, manifestations of liver damage are prominent—tender hepatomegaly, jaundice which may progress to an olive green hue, pruritis, bleeding from multiple sites, and finally hepatic encephalopathy characterised by drowsiness, confusion, ataxia, flapping tremor of hands (asterixis), stupor, and coma. At this stage there is a mousy odour to the breath (foetor hepaticus). · Renal damage results in oliguria, haematuria, albu-minuria, and acute renal failure. · ECG changes include tachycardia, ST and T waves changes, QTc prolongation, low voltage QRS, and various arrhythmias. · There may be terminal convulsions before death supervenes. · Early hypoglycaemia has a grave prognosis. Survival for three or more days is a good prognostic sign. Recent reports on phosphorus poisoning have indicated that the classical three phases of toxicity are not always encountered in these patients. The incidence of phosphorescent vomitus or faeces, oral mucosal burns, and presence of a garlicky odour on the breath or in gastric contents are also quite rare. Therefore, the absence of these findings does not preclude serious toxicity. · Garlicky odour of breath and vomitus. · Fuming or luminous vomitus and stools. · Evidence of hepatic and renal failure. · Hypokalaemia, hyperchloraemia, hypocalcaemia and both hyperphosphataemia and hypophosphataemia have been reported. · Hypoprothrombinaemia and thrombocytopenia may occur following ingestion, and lead to a delayed onset of haemate- mesis, haematochezia, haematuria, and haemorrhages into the skin and mucous membranes. Dermal contact with phosphorus results in acutely painful corrosion with yellow, necrotic, severely painful second or third degree chemical burns emitting garlic-like odour. Absorption from damaged skin may result in acute systemic phosphorus poisoning. This usually results from long-term occupational exposure to the fumes of phosphorus pentoxide and results in the condition called Phossy Jaw (Glass Jaw, Lucifer’s Jaw) (Fig 8.4) which was first described by Bristowe in 1862.Main features include toothache (usually origi-nating in a carious tooth), which because of its recurrence would be eventually extracted leading to exposure of bone followed by necrosis, sequestra-tion, and osteomyelitis of jaw (invariably the lower jaw). Chronic exposure to red phosphorus or phosphorus sesquisulfide may cause dermatitis. · Gastric lavage with potassium permanganate (1:5000), which oxidises phosphorus into relatively less toxic phosphoric acid and phosphates. Some authorities recommend administration of copper sulfate solution (250 gm in a glass of water), which converts phosphorus to non-toxic copper phosphide. Alternatively, a 0.2% solution of copper sulfate may be used for stomach wash. It must however be noted that copper sulfate being a highly toxic substance by itself is not a desir-able antidote, and in fact is placed in the international list of obsolete antidotes. · Do not administer milk or any oily/fatty foods, since this will enhance the absorption of phosphorus. · Vitamin K by IV drip (65 mg) slowly, to combat hypo-prothrombinaemia. · Isotonic saline and sodium lactate to treat shock, dehydration, and acidosis. · Glucose to combat hypoglycaemia. · Calcium gluconate for hypocalcaemia. · Whole blood/fresh frozen plasma to correct coagulation defects. · Steroids and inotropic support for shock. Some investigators suggest the use of N-acetylcysteine (NAC) in patients with stage I phosphorus toxicity. A dose regimen of 150 mg/kg in 200 cc D5W for 15 minutes, followed by 50 mg/kg in 500 cc D5W for 4 hours, and then 100 mg/kg in 1000 cc D5W for 16 hours is recommended. It is presumed that NAC may be effective in preventing progression of liver damage when given in stage I of the illness. · After initial flushing with large volumes of water to remove any residual chemical material, clean wounds with a mild disinfectant soap and water. Loose, nonviable tissue should be removed by gentle cleansing with surgical soap or formal skin debride-ment. Intravenous analgesia may be required. · Removal and debridement of closed blisters is controversial. Current consensus is that intact blis-ters prevent pain and dehydration, promote healing, and allow motion; therefore, blisters should be left intact until they rupture spontaneously or healing is well underway, unless they are extremely large or inhibit motion. · Prophylactic topical antibiotic therapy with silver sulfadiazine is recommended for all burns except superficial partial thickness (first-degree) burns. For first-degree burns bacitracin may be used, but effectiveness is not documented. · Depending on the site and area, the burn may be treated open (face, ears, or perineum) or covered with sterile nonstick porous gauze. Alternatively, a petrolatum fine-mesh gauze dressing may be used alone on partial-thickness burns. Daily dressing changes are indicated if a burn cream is used; changes every 3 to 4 days are adequate with a dry dressing. · Phosphorus particles in dermal burns can be visualised by employing the use of Wood’s lamp. · Phosphorus will fluoresce under ultraviolet light. · With the exposed areas immersed in water, loose or embedded phosphorus particles that are visualised under UV light can be mechanically but delicately removed safely under water. This technique may be a safer alternative than either the use of copper sulfate or silver nitrate, and may be the method of choice. · Removal of patient from source of exposure. · Dental treament and follow-up. · Garlicky odour in the vicinity of the mouth and in the gastric contents. · Bleeding points in the skin (subcutaneous haemorrhages). · Luminous gastric contents. * The contents will fluoresce under UV light. · Congestion and inflammation of affected skin and mucosa. · Enlarged fatty liver. Later there is evidence of aute yellow atrophy. Histopathological examination may reveal features of acute fulminant hepatitis: collapsed reticulin framework, with fibrosis between the hepatocytes showing bubbly, vacuolated cytoplasm. · There may also be fatty degeneration of heart and kidneys. · Viscera for chemical analysis must be preserved in satu-rated saline and not rectified spirit, otherwise luminosity especially of the stomach contents will be lost. · Accidental poisoning: This used to be common in the pastbecause of unrestricted use of phosphorus in matches and fireworks. Today, most cases of accidental poisoning result from inadvertent ingestion of cockroach or rat poison by children, or because of contamination of food by these substances. · Suicidal poisoning: This was also previously quitecommon, especially in Western countries. A popular method appears to have been to soak several “lucifer” match heads in water or brandy, mix with sugar, and consume the resultant potion. Today, rat pastes containing phosphorus are occasionally implicated in suicidal inges-tions. · Homicidal poisoning: Formerly, phosphorus was quitefrequently employed for committing murder. Several accounts are mentioned in the literature where poisoning was accomplished by mixing phosphorus in soup, jam, or rum, and administered to unsuspecting victims.